My Aunt Miriam, sister of my father Keith, wrote about it in her notes but she spelled it “Kilbute.” I wrote to Libraries and Archives in Ottawa the Canadian national archive and they knew very little about these locks. At the Family History Library in Salt Lake City, my husband found a book in which Archibald was featured as the lock master. Here is the source. Source: The Upper Ottawa Valley, by Clyde C. Kennedy, Renfrew County Council, Pembroke, Ontario, pg. 137-139, 1970 FHL Book#971.38 H2 (This is a book at the FHL and is not on microfilm.) I am sure copies are in other archives. 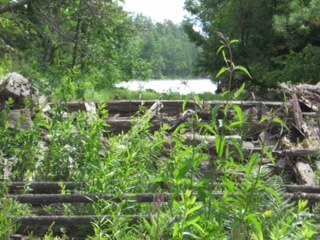 “Touring the Upper Ottawa River Pontiac Co., Quebec, Allumette Island and Chapeau,” May 27, 2012. “Touring the Upper Ottawa: Chichester Township, Pontiac Co, Quebec,” June 4, 2012. In the above post I had some photos of the Ottawa River from the bridge that spans the area from Chapeau to Chichester covering the Chenal de la Culbute on the Ottawa River. 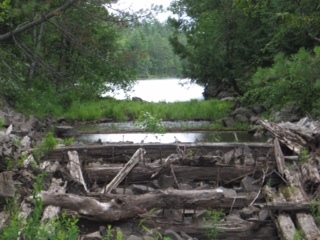 This is on the north side of the island of Allumette, but I was not able to find the remains of the Culbute Locks. I was told you had to have a boat to get there, so that was not something I was able or willing to do. A very nice reader contacted me back in September, 2014 when I was touring in Canada my second time and shared some photos of the canal and gave me another source for information. Here are the two photos that Gerald shared with me and I thank him for them. 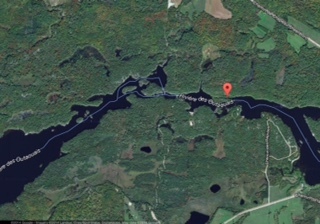 Gerald wrote in Sept 2014: I was at the Culbute yesterday, the water is high this year, I did not go as far as the locks, I canoed from my home on the Petawawa river to the rock portage. I am looking for the best portage trace to go around the Culbute (a set of 3 significant rapids). The area is dense forest with hills, boulders and swamp, not an easy task.  I am still trying to picture where the locks are located in relationship to the villages of Chapeau and Chichester. This article was interesting: Steamboats and Canals on the Ottawa River, Cultural Heritage Ottawa River.org: http://www.ottawariver.org/pdf/10-ch2-8.pdf. It is interesting to me that the end of the Culbute locks varies from when 1889 to 1896 from the sources I have read. What follows has even another opinion. Lumber interests persuaded the government to build a canal on the Culbute channel at the Calumet Rapids, known as the Rock Portage. Construction of the locks took place from 1873‐1876, involving two combined locks and opening up 124 kilometres of interior river navigation (Canadian Public Works Association 124). The Culbute Locks were outmoded before they were even completed. They were abandoned soon after their construction (Legget 1975: 174). I find it rather fun to see mentions of the Culbute Locks on the internet now. When I was trying to find out more about these locks I was overwhelmed with the Rideau Canal information. Now, in 2014 and 2015 there is much more about all canals and one can get very involved and fascinated about the history of canals in Canada and also in the United States. This entry was posted in Allumette Island, ARCHIE & MARY MCDONELL's FAMILY, Chapeau, Chichester, Pontiac Archives Shawville, Trip to Ontario & Quebec 2012, Upper Ottawa Valley and tagged Canals of Canada, Culbute Locks, Upper Ottawa Valley. Bookmark the permalink.